What’s so special about Nwadar? The site between Żonqor and Xgħajra offers interesting historical features for the planned national park. Way back in 1991, when I was a student at the Faculty of Architecture and Civil Engineering in the last two years of my course, a colleague and I, both specialising in urban planning and design, were given an urban planning and design project for the seaside village of Marsascala. As part of this academic project we had to carry out an appraisal of the state of this village and come up with proposals for improvement. I remember at that time we had chosen Żonqor Point as one of the design opportunity areas as it was literally a dump site. Heaps of inert waste were dumped there and from time to time levelled to form what was up to that time a projected road planned to link Żonqor Point to Xgħajra. This was my flashback when in the end of July last year I was asked whether I would accept to be nominated to stand on a technical steering committee to pave the way for the setting up of a national park in the area between Żonqor and Xgħajra. As in the preceding weeks public pressure had been mounting about this area, my initial reaction was to try to stay out of it. However, this flashback made me accept the invitation. It was time to give some contribution to the benefit of our environment and society. In the late afternoon of August 10, a day before the first meeting of the technical steering committee, I decided to take my first walk along the coast from Żonqor Point to Xgħajra. To be sincere, prior to this walk, I was a bit sceptical about the real value of the area and whether it merited becoming a national park. My past impressions of the dump site were still ingrained in my mind. The weather that afternoon was not helpful, as having a dull and cloudy sky at the beginning of August was abnormal. The first part of the walk confirmed my scepticism as the area, after 24 years, was still being used as a dump site. There was no sign of the entrenchments, which once I had read were built by the Order of St John in the area. The flora around me was the typical one found on severely disturbed areas and there was no sign of steppe habitat let alone garigue. On the other hand, the coast line was still mostly natural though very rough. The only human interventions clearly evident on these rocks were the extensive stretches of salt pens or salini, which form part of the industrial heritage of our country. The first architectural feature I found along the walk was a World War II pillbox, but the area around it seemed to have been recently disturbed. There was a huge underground tunnel which I later found out was the end part of the storm water and flooding relief project. A number of large stones scattered around a particular area, close to this new construction, attracted my attention. On closer inspection I realised that the stones were quite different from the modern inert waste found in the area, and most significant was the fact that they had been there for ages. I was pretty sure that these stones, coralline limestone or żonqor, had been surface quarried from the area. This meant that the area was a very old quarry. A coastal tower was now visible from a distance and at least two other pillboxes. These caught my attention and I kept on walking, notwithstanding the fact that it had started raining. When I got closer to the tower I found a large inlet along the coast. Geologically it appeared that once there was a cave accessed from sea level but which had collapsed. The effect of nature on this area was impressive. The coastal tower is one from a series built during the reign of Grand Master De Redin between 1658 and 1659. Just behind it there is another World War II pillbox and at less than 100 metres away there is another British coastal pillbox designed differently from the rest. Later I learned that this area is commonly known as Triq il-Wiesgħa. I kept on walking towards Xgħajra along a dirt track, keeping my eyes wide open in search of further historical features. The view towards Fort St Leonardo, located on higher ground, with terraced fields delineated by rubble walls, was impressive when seen from this path. I was now in search of possible traces of the Tignè entrenchment. This had formed part of an impressive project which the Order of St John had embarked on in the 1760s and supervised by Bailli de Tignè. 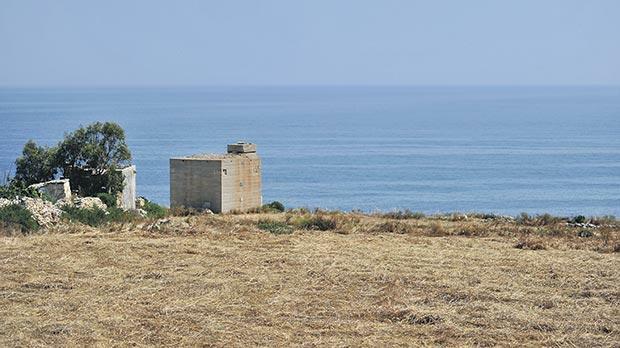 The project consisted in the building of a line of entrenchments starting from L-Aħrax tal-Mellieħa and ending at Wied il-Buni, Birżebbuġa, with the main objective being to defend the shallow coastline of the island facing the north east. This was a huge project but with very limited financial resources and although it had commenced on the ground, it was shortly abandoned. However, sections of entrenchments had been almost completed, such as those known as Luovier and Ta’ Kassisu (Mellieħa), Spinola-Dragonara (St Julian’s) and Wied il-Buni (Birżebbuġa). The stretch between Fort Ricasoli and Wied il-Għajn and another stretch at Xrobb il-Għaġin in Delimara were still under construction when the project was abandoned, less than a decade after it started. Following closer investigation on the rock surfaces and among the loose rubble in the area, sections of the entrenchment became clearly visible and I could easily follow up a significant stretch of this entrenchment including the formation of a shallow ditch in front of a line of trimmed rock. This was very exciting and unique when it comes to fortifications in Malta as it documents something which was still under construction. I thought that this could give added value to the interpretation of this very important cultural asset in the park. During my walk in the area, I was also surprised by another discovery – a circular pit dug in the rock along the line of the entrenchment itself. This for me was nothing else than a fougasse, an improvised mortar constructed by making a hollow in the ground or rock and filling it with explosives (originally, black powder) and projectiles. I became so excited by what I had seen that I did not realise that I was all wet from the drizzling rain. However, on my way back to my car, left parked next to the pool area, I realised that the site was far from my original impression and that it can easily offer a unique and at the same time relaxing experience to people visiting the park. This became my new vision for this first national park in south east Malta. Ruben Abela is a manager at Heritage Malta.